If you work with Cisco routers, you need a book like this to help you solve problems quickly and effectively. Even if you're experienced, the solutions and extensive explanations will give you new ideas and insights into router configuration. 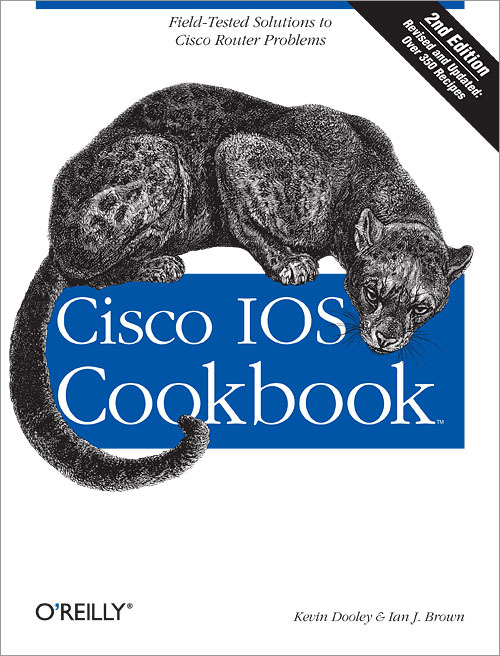 And if you're not experienced-if you've just been given responsibility for managing a network with Cisco routers-this book could be a job-saver. Kevin Dooley has been designing and implementing networks as an independent consultant for more than ten years. He's built large scale Local and Wide Area Networks for several of Canada's largest companies. Kevin holds a PhD in physics from the University of Toronto and is the author of "Designing Large-Scale LANs" (O'Reilly). View Kevin Dooley's full profile page. Ian J. Brown is a Cisco Certified Internetworking Expert with more than 12 years of experience in the networking industry. His areas of expertise include TCP/IP and IP routing, as well as management, security, design, and troubleshooting for large-scale networks. View Ian Brown's full profile page.